BuskerFest performers discuss the ins and outs of life as professional street artists. 26-year-old Kaile Glick is in character as soon as she sits in front of her typewriter. For the past five years she’s been playing the role of the Spontaneous Prose Store’s proprietor. On a normal day at work, like most buskers in Toronto, Glick finds a place to setup her equipment and then she waits for a customer to make eye contact with her so that she can draw them in with what she calls “carnival barking,” the distinct sound of her typewriter in midst of the downtown traffic and her short, lyrical poems. 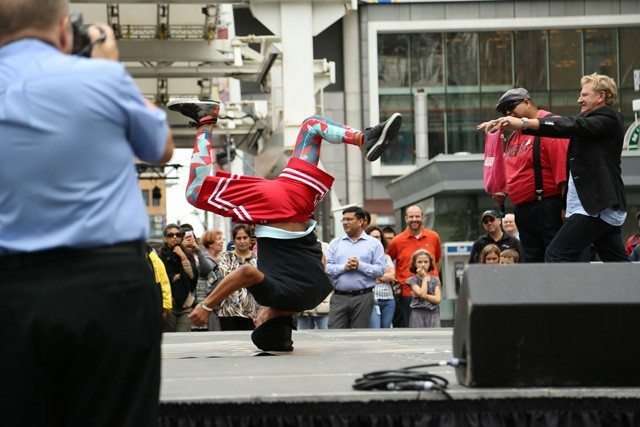 Glick is one of over 170 street performers that will be participating in BuskerFest, North America’s largest street performer festival, this weekend. Buskers from around the world will gather in the Yonge-Dundas area, bringing with them a variety of creative performances to raise funds for Epilepsy Toronto. But unlike most of the participants, Glick’s performance isn’t one that lures the audience in with visuals; her schtick comes to life on paper. Upon receiving a prompt from her audience (a title, first line or topic) she writes poetry that people can keep with them long after the festival is over. For Glick, professional street performers walk a line between being “professionals” and street performers. Events like BuskerFest bridge this gap by providing spaces that allow tough-to-classify creatives to showcase their talents at the heart of the city. The first time Glick performed at BuskerFest, in 2011, she was asked to leave because she didn’t realize she had to apply to be a part of the event. After a few years of travelling and performing at other festivals like Edinburgh Fringe, she decided to come back the right way. There’s a common belief among the performers at BuskerFest that the job of a street performer is not only to make a living and make art, but also to create a sense of community. One of the first things that Emily Hughes and Natalie Parkinson think about when they start working on a piece is having characters that interact with the audience. “The feeling you get when you are able to communicate with a diverse group of people beyond the verbal level is a kind of magic,” says Parkinson. Creators of the Hercinia Arts Collective, they’ve been a part of the BuskerFest for seven years and every year they try to combine theatre, acrobatics and visual art to put together an act that mirrors the variety in the festival at-large. This year they will be performing The Flying Machine, a piece inspired by Steampunk that tells the story of an inventor working on a flying machine. There are only a few stages at BuskerFest. For the most part the performers create their own pitches and they decide where and how they will transport their audience from the city into their narrative. Parkinson, Hughes and Glick are all working towards the same thing, whether they are at the festival or not: they are taking people out of the streets and into a new realm where the boundaries that exist between the performers and the audience are dissolved, where magic and art mean the same thing, where the backdrop of the ordinary becomes inspiration for endless possibilities. Toronto BuskerFest runs in the Downtown Yonge neighbourhood from August 27-August 30.